The 2019 National Teacher of the Year is Richmond’s Rodney Robinson. The Virgie Binford history teacher works with youth incarcerated in the city’s juvenile detention center. Mayor Levar Stoney and members of the Richmond Resident and Tenants Organization gathered for a press event in Richmond’s Gilpin neighborhood Thursday morning, and rallied in favor of his 2020 budget proposal. Virginia’s recent blackface scandal re-ignited conversations about the State’s racist history, and its lasting impact. 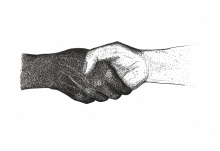 From kitchen tables to public forums, residents are talking about the many forms of racism that still exist and ways the community can respond. The Richmond Redevelopment and Housing Authority announced its new CEO, Damon Duncan Wednesday (2/21/2019), the position was vacant for the past 13 months. 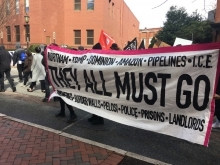 This Presidents’ Day, in the aftermath of Virginia’s blackface scandals, community leaders and members marched to the State’s Capitol to once again urge Governor Ralph Northam to resign. Monday, Virginia’s Black History Museum hosted a community discussion about blackface, and how the recent scandals in state politics connect the issues of racism and sexual violence throughout history. Earlier this week, Richmond’s public housing authority issued an update about continued heat loss in Gilpin Court, and say all affected apartments have been supplied with space heaters as a temporary measure. But residents say they’re still experiencing issues. A new exhibit at the Black History Museum explores themes of freedom through the lens of 38 artists. Two Richmond-based authors are challenging businesses and organizations to address bias in the workplace. In the book Erasing Institutional Bias, they identify different types of bias, its negative impacts and positive ways society can respond. For Virginia Currents WCVE’s Yasmine Jumaa has more.